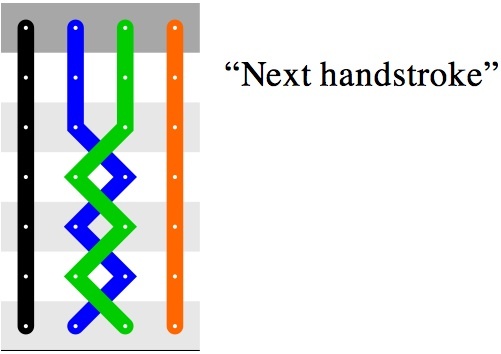 These exercises are drawn from Gordon Lucas’s book Kaleidoscope Ringing. The organization of the book and some typesetting errors make it a bit difficult to follow, perhaps particularly for less-than-advanced ringers; these notes are collated from what Lucas says in various places in the book, with gaps filled in by reasonable assumptions. The book covers more material than is summarized here, and in more detail. In sequence the exercises help a learner advance his/her ringing skills from ringing in rounds toward the level needed to ring Plain Hunt and methods. In addition, the figures shown here appear as sections of methods, as for example Long Places as Long 5ths in Plain Bob Doubles, Places as Making 2nds in Plain Bob on any number of bells and in leading and ringing at the back in Plain Hunt and most methods, and Dodges in Plain Bob and virtually every method. 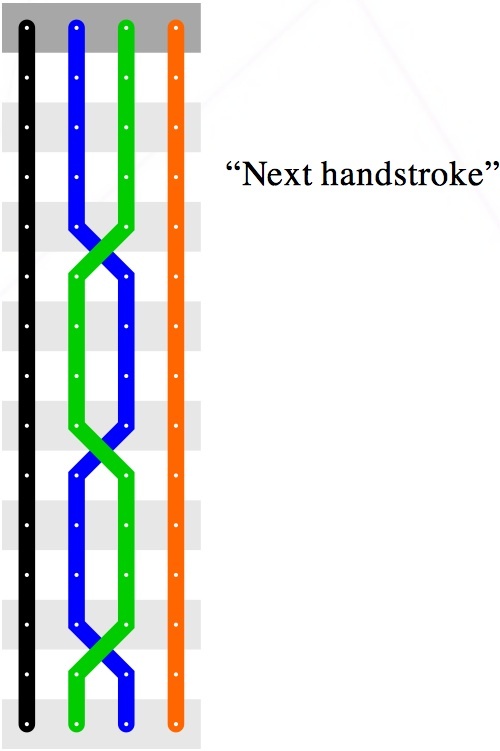 The exercise ends two strokes after the command “That’s all“. This is Lucas’s term for counting places in time with the bells striking (page 19). The counting should be done evenly, and count when each bell sounds (or should sound, even if that bell sounds is early or late). The counts do not mark when that ringer pulls, which is half a second or so before the bell sounds. Lucas recommends that learners begin to do this as soon as they begin ringing in rounds, and develop the habit until it becomes automatic. Here, for four bells each ringer would presumably count “1 2 3 4 1 2 3 4 uh” for each full pull, with the first “1 2 3 4” for the handstrokes, the second “1 2 3 4” for the backstrokes, and the “uh” (or “5”, or whatever works for that ringer) for the handstroke pause. Each count occurs when the bell in that place sounds or should sound. Lucas recommends that a learner be taught to look away from the bell they are following as soon as his/her blow is committed (page 6, point 2). Two ringers exchange places for two pulls (four blows), then back to their original places for two more full pulls, and so on until “That’s all” is called. 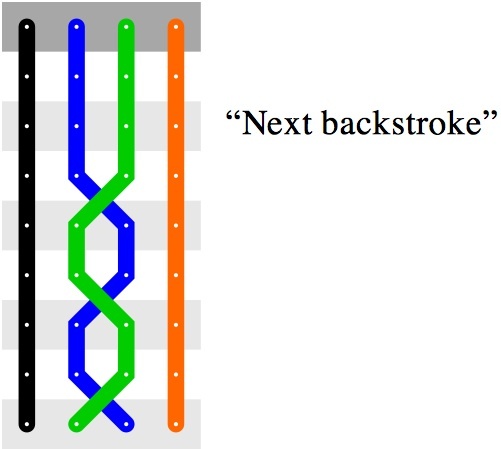 The exchanges occur between a backstroke and a handstroke for long places right, and between a handstroke and a backstroke for long places wrong. The ringers should not count the four blows, if possible, as that will interfere with counting the compass, but instead “feel” the first pull then the second pull before exchanging places again. Two ringers exchange places for one pull (two blows), then back to their original places for another pull, and so on until “That’s all” is called. 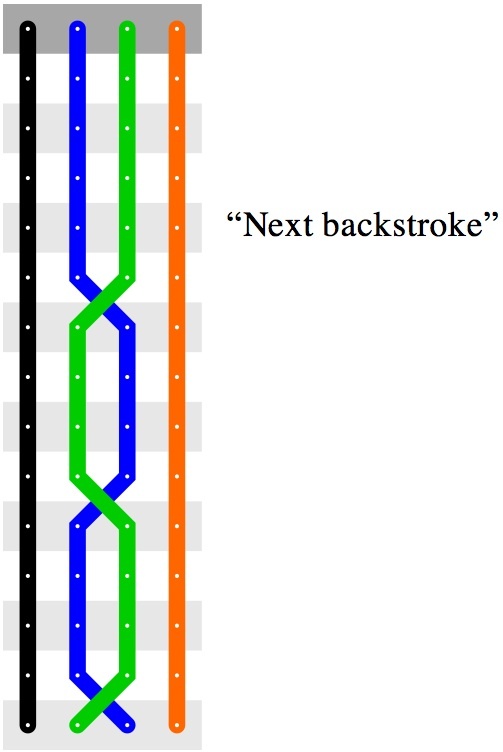 The exchanges occur between a backstroke and a handstroke for places right, and between a handstroke and a backstroke for places wrong. 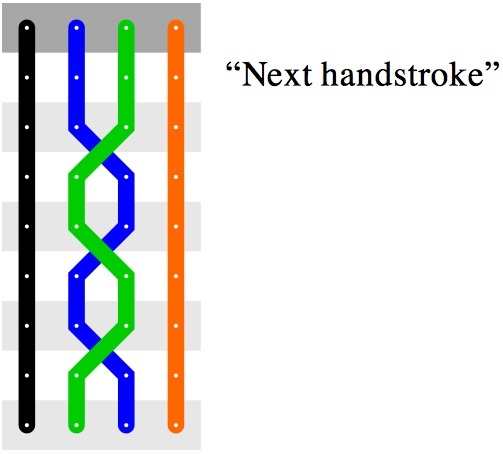 Two ringers exchange places at each stroke until “That’s all” is called. While dodges can begin right (between a backstroke and the next handstroke) or wrong (between a handstroke and the next backstroke), the skills involved are the same in both cases and Lucas does not distinguish them. “A dodge” is an exchange of places then an exchange back to the original places; a “double dodge” is four exchanges, as in the figure if the bells stop dodging after the bottom row; and a “triple dodge” is six exchanges. Lucas briefly presents examples of more-advanced compound figures made of sequences of Long Places, Places, and Dodges, a few of which are sketched in the figure at right. 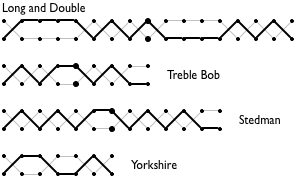 For many of these (but not all, for example the Yorkshire figure), the heavy line rung by one bell is the same as the light line rung by the other, except as if each bell is starting halfway through the other bell’s pattern. He recommends that instructors invent their own compound figures to serve the specific needs of the ringers they are working with, lists a number of possibilities beyond the four shown here, and discusses one in detail. The copy of the book the tower owns has several consistent typesetting errors, listed in the table at right.